Mycobacterium tuberculosis (Mtb) must adapt to various stress conditions during host infection. The two-component regulatory system (2CRS) SenX3-RegX3 is required for Mtb virulence. We showed recently that the senX3-regX3 intergenic region contains promoter activity, driving senX3-independent regX3 expression. In the current study, we tested the hypothesis that RegX3 has a SenX3-independent role in Mtb virulence. The gene expression patterns, growth, and survival of mutants containing transposon insertions in senX3 (senX3::Tn) and regX3 (regX3::Tn) were compared to those of their respective complemented strains and the isogenic wild-type parent strain during axenic growth in nutrient-rich broth, phosphate depletion, nutrient starvation, and in the lungs of BALB/c mice. regX3 expression was reduced in senX3::Tn during phosphate depletion and nutrient starvation, and expression of the phosphate-specific transport gene pstC2 was reduced similarly in senX3::Tn and regX3::Tn during phosphate depletion. Although senX3 and regX3 were each dispensable for Mtb growth in nutrient-rich broth, disruption of senX3 or regX3 caused a similar growth defect during phosphate depletion. 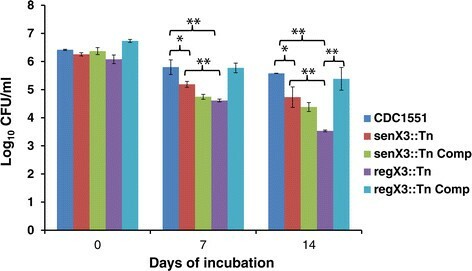 Interestingly, senX3::Tn, in which monocistronic regX3 expression is preserved, showed significantly higher survival relative to regX3::Tn after 7days of nutrient starvation (p <0.01), and in mouse lungs at Day 31 (p < 0.01), Day 62 (p < 0.01), and Day 124 (p = 0.05) after aerosol infection. Our data demonstrate the specificity of the senX3-regX3 2CRS for sensing and responding to low ambient phosphate, but also raise the possibility that RegX3 may function independently of its cognate sensor histidine kinase. Two component regulatory systems (2CRS) comprise a sensor histidine kinase (HK) and a response regulator (RR), which sense and respond to various environmental conditions, thus promoting bacterial survival . Upon detection of a specific stimulus, the HK autophosphorylates and transfers a phosphoryl group to the cognate RR, which promotes DNA binding of the latter to initiate transcription of the appropriate adaptive response ,. However, under certain circumstances, bacterial RR may also be phosphorylated by a noncognate HK or small molecule acetyl phosphate, merging different stimuli or diversifying the response to a single signal , or may function without being phosphorylated -. Twelve complete pairs of 2CRS and a few orphan HK and RR genes have been found in the Mycobacterium tuberculosis (Mtb) genome. SenX3-RegX3 was among the first 2CRS to be identified in Mtb ,. The senX3-regX3 operon is required for Mtb survival during murine infection -. However, conflicting results have been reported for the virulence of strains deficient in senX3 or regX3 in the lungs and spleens of BALB/c mice . Unlike the case in other 2CRS, expression of senX3 and regX3 is monocistronic as well as polycistronic ,, raising the possibility that each may function independently of the other under clinically relevant conditions and during host infection. In M. smegmatis, co-transcription of senX3 and regX3 is required for the expression of phosphate-dependent genes and for optimal growth under inorganic phosphate (Pi)-limiting conditions ,. Previously, we have shown that the senX3-regX3 operon is involved in the Mtb phosphate starvation response (PSR) , however the individual role of each gene in Mtb survival during Pi depletion has not been characterized. Moreover, RegX3, when overexpressed in M. smegmatis, can be phosphorylated in the absence of SenX3 in Pirich medium , and the SenX3-RegX3 homolog PhoBR in E. coli also responds to nutrient starvation in addition to Pi depletion . These findings suggest that Mtb SenX3-RegX3 may have a broader role in Mtb virulence beyond the PSR and that these two factors may function independently of each other. In order to further understand the role of each gene of the senX3-regX3 2CRS in Mtb virulence, and in particular the senX3-independent contribution of regX3, two different mutants deficient in senX3 or regX3 were studied under multiple conditions and their phenotypes were compared to the isogenic wild-type parent strain Mtb CDC1551, as well as their respective complemented strains. The expression of senX3 and regX3, as well as that of the phosphate specific transport gene pstC2, were evaluated in all the tested strains under physiologically relevant stress conditions. In addition, the growth and survival of each of these strains were assessed during axenic growth in nutrient-rich broth, Pi depletion, nutrient starvation, and after aerosol infection in the lungs of BALB/c mice. Our data support the hypothesis that RegX3 may have a SenX3-independent role in Mtb virulence. In order to confirm that phenotypes observed for senX3::Tn and regX3::Tn were attributable to deficiency of senX3 and regX3, respectively, we complemented each mutant by reintroducing the native gene. Due to the complexity of the operon, which includes monocistronic and bicistronic transcription of each gene , each mutant was complemented with the entire senX3-regX3 operon. Successful complementation was confirmed by Southern blot using dig-labeled probes after DNA digestion of complement candidates, as well as the wild-type and mutant strains. As expected, digestion of genomic DNA with FseI and hybridization with dig-labeled senX3 probe revealed fragments of 5.7-kb and 7.7-kb in the senX3::Tn complemented strain (senX3::Tn Comp), a 3.7-kb fragment in the wild-type strain, and a 5.7-kb fragment in senX3::Tn (Figure1B and D). SphI digestion of genomic DNA followed by binding of dig-labeled regX3 probe showed 4.6-kb and 7.5-kb fragments in the regX3::Tn complement candidate strains (regX3::Tn Comp), a 5.5-kb fragment in the wild-type strain, and a 7.5-kb fragment in regX3::Tn (Figure1C and E). In addition, kanamycin and hygromycin resistance cassettes were PCR-amplified from each of these complemented strains (data not shown). We have shown previously that bicistronic expression of regX3 was abolished in senX3::Tn, although monocistronic expression of the gene is preserved in this strain . Genetic confirmation of complementation of senX3 ::Tn and regX3 ::Tn. (A). Diagram of a 2824-bp fragment containing the senX3-regX3 operon from the genome of wild-type CDC1551. (B) FseI digestion of genomic DNA and hybridization with dig-labeled senX3 probe reveals fragments measuring 3.7-kb and 5.7-kb in CDC1551 and senX 3::Tn, respectively, as well as 5.7-kb and 7.7-kb fragments in senX3::Tn Comp. (C) SphI digestion of genomic DNA followed by hybridization with dig-labeled regX3 probe reveals 5.5-kb and 7.5-kb fragments in CDC1551 and regX3::Tn, respectively, as well as 7.5-kb and 4.6-kb fragments in regX3::Tn Comp. (D) Southern analysis of senX3 complementation. Lanes 1 and 2: SenX3::Tn Comp candidates with appropriately-sized bands; Lane 3: SenX 3::Tn; Lane 4: Wild-type CDC1551. (E) Southern analysis of regX3 complementation. Lane 1: Wild-type CDC551; Lane 2: regX 3::Tn; Lanes 35: regX3::Tn Comp candidates with appropriately-sized bands. Mildly reduced expression of senX3 and regX3 relative to sigA was observed in regX3::Tn and senX3::Tn, respectively, in Middlebrook 7H9 broth compared with the wild type parent strain (Figure2A; p >0.05). Although regX3 can be expressed independently of senX3, disruption of the latter gene led to decreased Mtb expression of regX3 during Pi depletion (p < 0.01) (Figure2B). Gene expression levels of senX3 and regX3 were restored in senX3::Tn Comp and regX3::Tn Comp, respectively, during Pi depletion, but the cognate genes were overexpressed in each complemented strain relative to the wild type (p < 0.05) (Figure2B), likely due to a second copy of each of these genes in the respective complemented strains. In Middlebrook 7H9 broth, mild down-regulation of pstC2 expression was observed in senX3::Tn and regX3::Tn relative to the wild-type strain (p < 0.01), and wild-type pstC2 transcript levels were restored in each of the complemented strains (Figure2C). Each mutant showed similar, significant down-regulation of the Pi-specific transport gene pstC2 relative to the wild-type strain during Pi depletion (p < 0.01), and wild-type expression levels of the gene were restored in each complemented strain (Figure2D). Disruption of senX3 led to decreased expression of regX3 during nutrient starvation (p < 0.05). However, wild-type levels of senX3 and regX3 expression were not observed in senX3::Tn Comp and regX3::Tn Comp, respectively, although senX3 expression was partially restored in regX3::Tn Comp under this condition (data not shown). The abundance of pstC2 transcripts was not significantly altered in either mutant relative to wild type during nutrient starvation (p > 0.05). Gene expression and regulation of senX3 , regX3, and the phosphate-specific transport gene pstC2 in each strain by qRT-PCR. An equal amount of total RNA samples were used for cDNA synthesis with random primers. The cycle threshold value (CT) of each gene of interest was normalized to that of the housekeeping gene sigA to generate ΔCT, which was then converted to fold change (1.83e-ΔCT). (A) Expression of the genes senX3 and regX3 in Middlebrook 7H9 broth. (B) Expression of the genes senX3 and regX3 during Pi depletion. (C) Expression of the pstC2 gene in Middlebrook 7H9 broth. (D) Expression of the pstC2 gene during Pi depletion. The samples were prepared as duplicates and the experiment was repeated twice with similar results. *p <0.05; **p <0.01. The growth kinetics of each mutant and its respective complement, together with the isogenic wild-type strain, were studied during Pi depletion (50 μM Pi) and in reconstituted, Pi-replete 7H9 broth (25mM Pi). Each strain showed equivalent growth in Pi-replete 7H9 broth (Figure3A), suggesting that senX3 and regX3 are dispensable for axenic Mtb growth when Pi is abundant. However, senX3::Tn and regX3::Tn showed a marked growth defect and premature entry into stationary phase relative to the isogenic wild-type and their respective complemented strains during Pi depletion (Figure3B). No obvious difference in growth was observed between the mutants. Mtb senX3 and regX3 are required for optimal growth during P i depletion, but not in P i -replete broth. The wild-type, senX3::Tn, senX3::Tn Comp, regX3::Tn, and regX3::Tn Comp strains were each cultured in reconstituted 7H9 broth containing 25mM Pi (A) and Pi-depleted broth (50 μM Pi) (B). Each experiment was repeated twice with similar values of optimal density (O.D.600nm). Previously, we have shown that Mtb bacilli undergo elongation following Pi depletion . In order to determine the effect of senX3 or regX3 deficiency on Mtb morphology during Pi depletion, we used transmission electron microscopy to capture images of at least 40 bacilli of each strain following 21days of Pi depletion or during exponential growth in reconstituted, Pi-replete 7H9 broth. We found that the mean length of Pi-depleted senX3::Tn and regX3::Tn bacilli was 2.62 ± 0.72 and 2.96 ± 0.69, respectively, while the mean length of isogenic wild-type bacilli was 4.02 ± 1.10 (p > 0.05). The mean length of the senX3::Tn and regX3::Tn complement bacilli was 4.02 ± 1.36 and 3.76 ± 0.85, respectively (p > 0.05) (Figure4A-E). The mean length of senX3::Tn bacilli (2.48 ± 0.48) and regX3::Tn bacilli (2.44 ± 0.72) was equivalent to that of wild-type bacilli (2.46 ± 0.60) during exponential growth in Pi-replete (25mM Pi) broth (p > 0.05). The contribution of senX3 and regX3 to bacillary elongation during P i depletion. Transmission electron microscopy (TEM) was used to compare the morphology of all the strains after growth in reconstituted 7H9 broth containing 50 μM Pi for 21days. The images are representative of the following strains: A. Wild type; B. senX3::Tn; C. senX3::Tn Comp; D. regX3::Tn; E. regX3::Tn Comp (20,000x magnification). Since both monocistronic and bicistronic expression of regX3 is observed in nutrient-starved Mtb , we next studied the requirement for each type of gene expression during nutrient starvation. After 7days of nutrient starvation, senX3::Tn and regX3::Tn showed a significant survival defect relative to wild type (p < 0.05 and p < 0.01, respectively), which was complemented in regX3::Tn Comp but not in senX3::Tn Comp (Figure5). At this time point, senX3::Tn, in which monocistronic expression of regX3 is maintained , showed higher survival relative to regX3::Tn (p < 0.01). By 14days after nutrient starvation, regX3::Tn showed markedly reduced survival relative to wild type (p < 0.01) and senX3::Tn (p < 0.01). The survival defect at 14days was almost completely reversed in regX3::Tn Comp (p < 0.01 relative to the mutant). Both senX3 and regX3 are required for Mtb survival during nutrient starvation, although there appears to be a senX3 -independent contribution of regX3 . The wild-type CDC1551, senX3::Tn, senX3::Tn Comp, regX3::Tn, and regX3::Tn Comp were subcultured in 1xPBS with 0.05% Tween-80 and CFU were counted at different time points after plating the diluted cultures on Middlebrook 7H10 plates (mean ± SD) and incubating for 21days. Triplicate samples were used in the experiment and the experiment was repeated twice under the same condition. *p <0.05; **p <0.01. In order to evaluate the potential senX3-independent role of regX3 on Mtb virulence in vivo, we aerosol-infected mice with wild type, senX3::Tn, regX3::Tn, and their respective complemented strains. We observed no significant growth defect for the two mutants during the first 15days post-infection relative to the wild-type (Figure6). By Day 31, the wild-type strain achieved a peak bacterial CFU of 6.89 ± 0.13 log10 in the lungs, and a reduction in mean lung CFU of 0.5 log10 (p < 0.01) and 1.51 log10 (p < 0.01) was observed in senX3::Tn and regX3::Tn, respectively. By Day 124, mice infected with senX3::Tn and regX3::Tn had significant reductions in lung bacillary loads of 1.6 log10 CFU (p < 0.01) and 2.6 log10 CFU (p < 0.01) relative to mice infected with the wild-type strain. Interestingly, as in the case of nutrient starvation, consistently and significantly higher lung bacillary burdens were observed in mice infected with senX3::Tn compared to those in mice infected with regX3::Tn at Day 31 (p < 0.01), Day 64 (p < 0.01), and Day 124 (p = 0.05) post-infection (Figure6). In fact, at Day 124, the lungs of mice infected with senX3::Tn had more than 10-fold higher mean CFU relative to those of mice infected with regX3::Tn (p = 0.05). This lung survival defect was partially restored in regX3::Tn Comp (p = 0.05 relative to regX3::Tn; Figure6). Both senX3 ::Tn and regX3 ::Tn are attenuated, but there appears to be a senX3 -independent contribution of regX3 for long-term Mtb survival in mouse lungs. Separate groups of BalB/c mice (45 mice per group) were aerosol-infected with the wild-type CDC1551, senX3::Tn, senX3::Tn Comp, regX3::Tn, and regX3::Tn Comp. *p <0.05; **p <0.01. Histopathological examination of mouse lung samples at Day 124 revealed a patchy lymphocytic bronchiolitis with varying extension of the inflammation into the adjoining airways characterized by intra-alveolar macrophages and lymphoid aggregates (Figure7A-E and Table1). Bronchiolar obliteration and coalescence of bronchioles was not identified. A perivascular lymphocytic infiltrate was also noted in some of the cases. 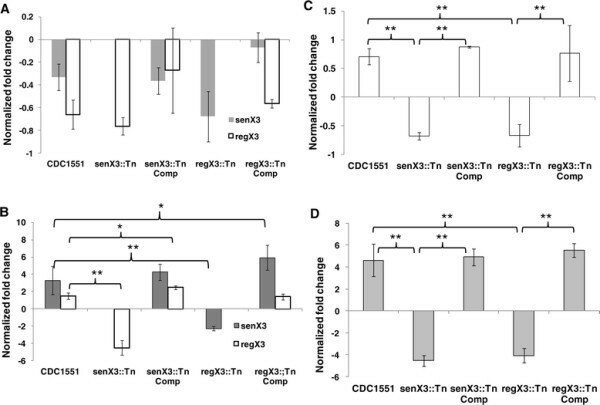 Lung inflammation was less pronounced in animals infected with senX3::Tn and regX3::Tn compared with the wild-type strain and their respective complements (Figure7 A-E). One-way analysis of variance (ANOVA test) across strains showed a statistically significant difference of means in percent inflamed bronchioles (p < 0.05) (Table1). However, the small number of cases examined precludes a definitive assessment of statistical significance. Acid-fast staining revealed no major differences between groups (data not shown). Histological evaluation of infected mouse lungs at Day 124 post-infection. Hematoxylin-eosin stains, 200x magnification. A. CDC1551; B. senX3::Tn mutant; C. senX3::Tn Comp; D. regX3::Tn; E. regX3::Tn Comp. SenX3-RegX3 is among the best characterized 2CRS in Mtb ,, yet many questions remain about its role in virulence. Homologs of senX3 and regX3 are found in the genomes of various mycobacterial species, indicating that this evolutionarily conserved 2CRS may play a fundamental regulatory role in mycobacterial physiology . Unlike other 2CRS, in which expression of the operon is bicistronic and auto-regulatory, senX3 and regX3 can be transcribed independently of each other . 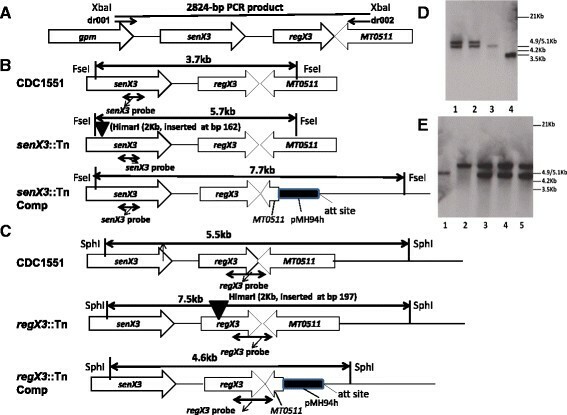 In particular, the intergenic region between the two genes contains several mycobacterium interspersed repetitive units (MIRU), which exist only in M. leprae and members of the Mtb complex ,,,,, and which can drive senX3-independent expression of regX3. In the current study, we sought to investigate the senX3- independent contribution of regX3 to Mtb gene regulation, growth, and survival under various physiologically relevant growth-limiting conditions in vitro and in vivo. We found that the genes senX3 and regX3, while dispensable for Mtb growth in nutrient-rich broth, are equally required for optimal growth and morphological response during Pi depletion. In addition, as evidenced by the statistically greater survival of senX3::Tn relative to regX3::Tn, we found that regX3 contributes to Mtb survival independent of senX3 during prolonged nutrient starvation and chronic infection in mouse lungs. Although SenX3-RegX3 has been implicated in the mycobacterial PSR ,,, the functional role of each gene in this operon has not been characterized previously during Pi depletion. Pi depletion is believed to be a physiologically relevant microenvironment encountered by Mtb within the arrested macrophage phagolysosome . Mtb senX3-regX3 is upregulated in response to Pi depletion and expression of the phosphate-specific transport operon pstS3-pstC2-pstA1 is RegX3-dependent . Previously, we have shown monocistronic upregulation of senX3 and regX3 during Pi depletion , which differs from M. smegmatis, in which the senX3-regX3 operon is co-transcribed. In the current study, we found decreased expression of regX3 in the senX3-deficient mutant relative to the wild type during Pi depletion, which could be restored by reintroduction of senX3. Decreased regX3 expression in Pi-depleted senX3::Tn may be due to decreased co-transcription with senX3 or down-regulation of independently expressed regX3. Although the senX3 promoter is autoregulatory and activated by RegX3, which is phosphorylated by SenX3 , it is unknown whether the intergenic region driving independent regX3 expression is also RegX3-dependent, and, hence, SenX3-dependent. We found that Mtb mutants deficient in senX3 or regX3 exhibited similar growth defects during Pi depletion. Despite expression of regX3 in the senX3-deficient mutant, it appears that RegX3 was not functional, as expression of the RegX3-dependent, Pi-specific transport gene pstC2 was dramatically downregulated in this strain. Our results are consistent with monocistronic, Pi-dependent expression of each gene and the putative role of SenX3 as a Pi sensor . Therefore, although monocistronic expression of regX3 is preserved in senX3::Tn , the cognate HK SenX3 may be required to phosphorylate and activate RegX3 during Pi depletion, thereby triggering the PSR. In vitro studies in many bacteria have provided evidence in favor of the specificity of 2CRS, in which the HK show a remarkable kinetic preference for their cognate RR primarily at the level of molecular reorganization -. For example, in B. subtilis the HK KinA can phosphorylate either Spo0F or Spo0A, but with more than 50,000-fold preference for Spo0F during sporulation ,. 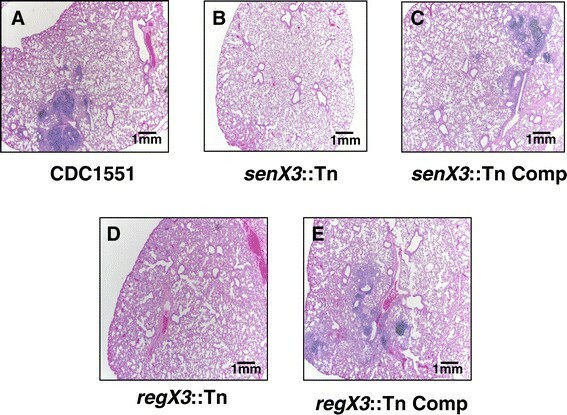 Interestingly, despite similar growth phenotypes of senX3::Tn and regX3::Tn during Pi limitation, the senX3-deficient mutant showed markedly higher survival relative to the regX3-deficient mutant upon prolonged nutrient starvation and in the lungs of mice, while both mutants were attenuated compared with the wild-type. Our gene expression results demonstrate reduced but detectable expression of regX3 in the senX3-deficient mutant. This discordance in phenotypes suggests the possibility that independently transcribed regX3 may be translated and phosphorylated in the absence of SenX3, thereby initiating transcription of the RegX3 regulon ,,. In M. smegmatis, the essential gene regX3 can be activated in the absence of the nonessential gene senX3 in Pi-replete broth, suggesting the existence of alternative mechanisms of RegX3 phosphorylation . Similarly, in E. coli the RegX3 homologue PhoB can be phosphorylated by the HK EnvZ , CreC (PhoM), or acetyl phosphate in the absence of PhoR in Pi-independent pathways . Precedents for phosphorylation of RR by noncognate HK are also present in Mtb. Thus, the Mtb dormancy response regulator DosR can be phosphorylated by its cognate HK DosS or by the orphan HK DosT ,. Although 2CRS usually maintain specificity to prevent unwanted cross-talk -, significant sequence and structure similarity in HK and RR, as well as the existence of small molecule phosphodonor acetyl-phosphate make cross-regulation possible -. In addition, cross-regulation could occur at the transcriptional level ,. Under certain circumstances many bacteria appear to employ cross-regulation in order to integrate multiple signals or diversify the response to a single input ,. Therefore, based on our initial findings, we speculate that although Mtb senX3-regX3 2CRS maintains specificity during Pi depletion, cross-regulation of RegX3 may facilitate a rapid response of Mtb to a changing environment in vitro and in vivo under other stresses, in which the identity of alternative HK and/or other activating factors remains to be determined. Alternatively, independently transcribed RegX3 may be functional in the absence of phosphorylation. For example, the Pseudomonas aeruginosa RR AlgB and AlgR do not require phosphorylation by the cognate HK KinB for alginate production in vivo, indicating that these RR may mediate activation of gene expression through alternative mechanisms . We speculate that the SenX3-RegX3 2CRS may provide a common means by which to transduce the signals of Pi depletion and nutrient starvation, leading to induction of the stringent response, which is critical for Mtb persistence in the host ,. Our findings are consistent with the function of the homologous PhoBR 2CRS in E. coli, which regulates the transcriptional response to Pi depletion and nutrient starvation ,. The mechanism of regX3 regulation during nutrient starvation and in vivo infection remains to be identified. Higher survival of senX3::Tn relative to regX3::Tn during chronic infection in mice is consistent with previous data showing higher survival of a senX3 deletion mutant relative to a regX3 deletion mutant in mouse spleens . However, our data conflict with those of Rickman et al. in that they showed greater attenuation of the senX3 deletion strain in mouse lungs relative to the regX3 deletion strain. These discrepant findings may be due to methodological differences between our study and that by Rickman et al. The latter study used H37Rv, in which the senX3-regX3 IR comprises three identical 77-bp MIRU rather than two 77-bp MIRU and one 53-bp MIRU, as in the CDC1551 strain used in our study ,. In addition, Rickman et al. used intravenous infection rather than aerosol infection, although both studies used BALB/c mice. Nevertheless, these two studies corroborate our recent finding that senX3 and regX3 do not simply function as a bicistronic operon, as previously thought , since, in such a case, disruption of senX3 would be expected to yield mutant phenotypes identical to those of a regX3-deficient strain. In the current study, both complemented strains restored wild-type growth and survival during Pi depletion, and, in the case of regX3::Tn Comp, during nutrient starvation and in the lungs of mice. However, unlike in a previous study , our complemented strains failed to restore the wild-type phenotype during mouse infection. There are several potential explanations for these discrepant findings. In comparison to the cloning strategy by Rickman et al., our senX3-regX3 complementation construct lacked a 211-bp sequence upstream of the senX3 gene, which may have altered regulation of this gene during the in vitro stress conditions studied and mouse infection. Another difference between the two complementation approaches is that in the earlier study the senX3 and regX3 genes were fused together by deleting the intergenic region . On the other hand, each of our complemented strains included this intergenic region, since we recently described the potential importance of its promoter activity in driving senX3- independent expression of regX3. The precise role of this intergenic region in regulating expression of each of these genes requires further study. In addition, the presence of a second copy of the regX3 gene may have had a deleterious effect on in vitro and in vivo survival. As in the case of other defective complemented strains, the chromosomal location at the recombination site may have affected proper expression of senX3 and regX3. Alternatively, the development of other occult mutations during genetic construction of these strains may have contributed to their reduced virulence relative to the wild-type strain. However, deficiency of senX3 or regX3 was reported previously to be associated with reduced Mtb virulence in mice, and the attenuated mutant phenotypes were fully complemented in the study by Rickman et al. . Therefore, we favor the explanation that our complementation strategy, as described above, contributed to the incomplete restoration of the wild-type phenotypes in the complemented strains. The mechanisms by which senX3 and regX3 are regulated under different stress conditions require further characterization. Our data raise the interesting possibility that differential regulation of senX3 and regX3 may have evolved to allow for simultaneous coordination of the Mtb PSR , while providing a common means by which bacilli may respond to a variety of different physiologically relevant stress conditions. In particular, the mechanisms underlying the SenX3-independent contribution of RegX3 to Mtb virulence deserves further investigation. Supplemented Middlebrook 7H9 broth (7H9 broth, Difco), reconstituted 7H9 broth containing 50 μM Pi (Pi depletion) , and 1xPBS (Biological Quality) containing 0.05% Tween-80 (nutrient starvation)  were used to study growth kinetics and bacterial survival. Mycobacterium tuberculosis CDC1551  was used as the wild-type strain in all experiments. Mtb strains deficient in Rv0490/MT0509/senX3 (senX3::Tn; Tn insertion at bp 162/1233) and Rv0491/MT0510/regX3 (regX3::Tn; Tn insertion at bp 197/693) were generated previously by mutagenesis of Mtb CDC1551 with the Himar1 transposon (Tn) . The Tn insertion in the senX3::Tn mutant is expected to abrogate histidine kinase function, since the phospho-acceptor domain is located between bp 465657. Similarly, disruption of regX3 phospho-receiver and DNA-binding domains at bp 21345 and bp 459684, respectively, is expected by the Tn insertion in the regX3::Tn mutant. The E. coli- mycobacterium shuttle vector pMH94  was used for complementation of senX3::Tn and regX3::Tn. A 2,824-bp DNA fragment containing the entire senX3-regX3 coding region, including 324-bp of 5 flanking sequence and 378-bp of 3 flanking sequence was PCR-amplified from Mtb CDC1551 genomic DNA using primers dr001 and dr002 (Table2 and Figure1A), which introduced an XbaI site at the 5 end of each PCR product. After digestion with XbaI, the 2,824-bp PCR product was ligated with similarly digested pMH94, yielding psenX3-regX3, which was transferred into E. coli DH5α competent cells, followed by plating on hygromycin-containing LB agar plates. After confirmation by DNA sequencing, the construct was electroporated separately into senX3::Tn and regX3::Tn competent Mtb cells. Individual transformant colonies were selected on 7H10 agar plates containing kanamycin (25 μg/ml) and hygromycin (50 μg/ml). Genomic DNA was purified from senX3::Tn and regX3::Tn complemented strain candidates. Genetic complementation of senX3::Tn and regX3::Tn was first confirmed by PCR. Specifically, the kanamycin gene from each transposon insertion was PCR-amplified using the primer pair kan-F/kan-R and the hygromycin gene from the shuttle vector was amplified using hyg4-F/hyg4-R. The sequences of each primer pair are listed in Table2. In order to further confirm complementation of senX3::Tn and regX3::Tn, Southern blotting was performed using DIG High Prime DNA Labeling and Detection Starter Kit I according to the manufacturers protocol (Roche). Genomic DNA from senX3::Tn and regX3::Tn complement candidates was digested with FseI and SphI-HF (New England Biolabs), respectively, and electrophoresis was performed on 1% agarose gels. Following denaturation and neutralization, the gels were transferred onto positively charged nylon membranes (GE Healthcare). DNA fragments containing the senX3 and regX3 genes on the membranes were detected by using digoxigenin(dig)-labeled senX3 and regX3 probes, respectively, which were generated by adding dig-dUTP in PCR reactions containing primer pairs senX3-F and senX3-R (yielding a 196-bp fragment of the senX3 gene) or primer pairs dl15 and dl16 (yielding a 576-bp fragment of the regX3 gene) (Table2). After pre-hybridization, the membranes were hybridized with dig-labeled senX3 or regX3 probes at 68C overnight, prior to addition of anti-digoxigenin-AP. After stringent washes, the membranes were incubated with the chemiluminescence substrate CSPD (Roche) and exposed on X-ray film at room temperature. Finally, the films were developed in a dark room (AFP imaging). Total RNA from each Mtb strain was purified from nutrient- and Pi-starved cultures after 24hr followed by DNase treatment to remove contaminating DNA ,. Gene expression levels were detected using the primer pairs listed in Table2 and iCycler 5.0 (Bio-Rad). cDNA was synthesized with random hexamers (Invitrogen) using an equal amount of total RNA samples, which was subjected to two technical replicates of PCR amplification and then averaged to generate a single value for each biological replicate. The cycle threshold value (CT) measured for each gene was normalized to that of the house-keeping gene sigA under each condition and then converted to fold change (1.83e-ΔCT) ,. senX3 expression was determined by primer pair senX3-F/senX3-R, which amplified from bp 635 to bp 830 of the senX3 gene, distal to the transposon insertion site (bp 162). regX3 expression was studied using primer pair regX3-F/regX3-R, which amplified from bp 20 to bp 212, across the transposon insertion site of the regX3 gene (bp 197). The samples were prepared as duplicates and statistical analysis was performed using two biological replicates for each sample. For kinetics studies during inorganic Pi depletion, the pellet of each strain was washed with reconstituted Middlebrook 7H9 broth containing 50 μM Pi, resuspended in 10 ml (final O.D.600nm ~0.05) of the same broth in conical tubes, and incubated at 37C in a roller incubator. O.D.600nm values for each strain were measured by portable spectrometer (Biorad) at each time point up to 12 days. The growth kinetic of each strain in Middlebrook 7H9 broth (Difco) was observed up to 17 days. The experiment was repeated twice under the same growth conditions. For nutrient starvation conditions, the bacterial pellet of each strain was washed with 1xPBS (0.05%Tween-80) three times followed by re-suspension in 3ml (final O.D.600nm ~0.1) of 1xPBS (0.05%Tween-80) in a 15-ml conical tube prior to standing incubation at 37C. Colony-forming unit (CFU) counts were assessed at Day 1, Day 7, and Day 14 by plating the culture on Middlebrook 7H10 agar after serial dilutions (Fisher). All the samples were prepared as triplicates and the experiment was repeated twice. Fixed phosphotungstate (PTA) negative stain for electron microscopy study was used to evaluate bacterial morphology . Bacterial cultures were fixed and viewed (Hitachi H-7600 TEM [80kV]), followed by digital capture (direct magnification, 20,000). The length of each strain was measured using ImageJ software. All animal procedures followed protocols approved by the JHU Animal Care and Use Committee. Female BALB/c mice (46 weeks; Charles River) were housed in a Biosafety Level-3, specific pathogen-free facility and fed water and chow ad libitum. Separate groups of mice were aerosol-infected using the Inhalation Exposure System (Glas-Col, Terre Haute, IN) calibrated to deliver ~102 bacilli of one of the following Mtb strains: CDC1551, senX3::Tn, regX3::Tn, senX3::Tn complement, or regX3::Tn complement. 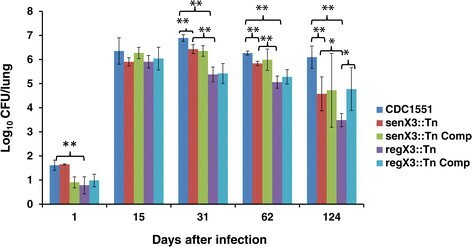 Groups of 4 mice in each group were sacrificed on Days 1, 15, 31, 62, and 124 post-infection. Lungs were removed aseptically and homogenized, and organ homogenates were diluted and plated on supplemented Middlebrook 7H11 plates to determine CFU counts (Fisher). The upper lobe of the left lung was processed for histological evaluation . Lung sections were examined for the presence or absence of bronchiolitis, bronchiolar obliteration, granulomatous inflammation, and coalescence or confluence of inflamed bronchioles. The type and predominance of inflammatory cell type (lymphocyte, macrophage, or neutrophil) was noted. For each slide both the total number of bronchioles and the number of inflamed bronchioles were counted. Sections were also examined for the presence or absence of perivascular inflammation. Means and standard deviations were calculated for each data set. Differences between calculated means were compared by the Students t test in all experiments except for histology studies, where the difference of means in percent inflamed bronchioles was compared by ANOVA test. A p-value ≤ 0.05 was considered statistically significant. The experimental design was developed by DR and PCK. The experiments were performed by DR. DB was responsible for histological analysis. All authors contributed to writing of the manuscript. All authors read and approved the final manuscript. This work was supported by NIH grants AI083125 and HL106786.